It was so meaningful to visit the Nobel Museum in Stockholm (likely because a certain someone has a dear family member who is a Nobel Laureate). Simply put, we were bursting with excitement as we stepped inside. Stepping out of the bright sunshine and into the subdued lighting of the museum, our eyes blinked opened to the work of Alfred Nobel and the Nobel winners. What a beautiful sight before us. 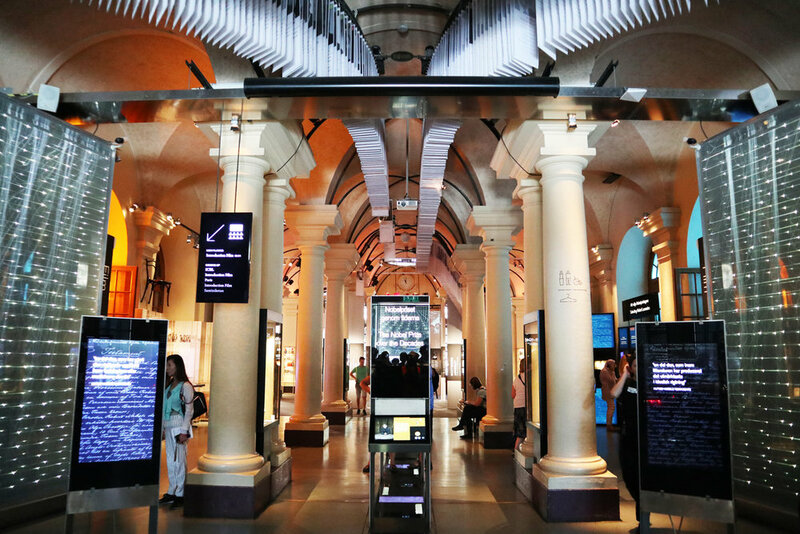 Interactive kiosks and displays located throughout the museum shared inspiring stories. High above, images of the Nobel Laureates whirred by. Alfred’s medicine bag, samples of his letters, details of his travels, and stories of his family and their tragic loss were also displayed. A nearly perpetual traveler and writer, he also endured ongoing health challenges. We joined in an English language tour (which was free) to learn even more. Our Nobel tour leader was doing an amazing job of sharing riveting history in this very small room (above), when all of a sudden a teen and her father entered. I initially thought they entered the small (filled to capacity) room to quietly listen to the tour. Needless to say, my eyes almost popped out of my head when the teen walked through our seated tour group, then loudly and disdainfully told me to get out of her way (I was standing in a back corner). I was grateful I remembered to just breathe as I moved aside. When the teen and her father stood in front of the tour and held loud conversation over our tour leader’s voice, our tour guide educated them about the need to be quiet and respect the tour. This is when the father admonished the tour. My eyes popped again. I kept breathing. These things happen. Sometimes another’s behavior can feel so overwhelming that their presence nearly ruins a lovely event. And trying to educate those who feel entitled can result in escalating behavior. Yet when it’s safe to simply breathe, calm can prevail within us. And the ceremony! Can you imagine being there? 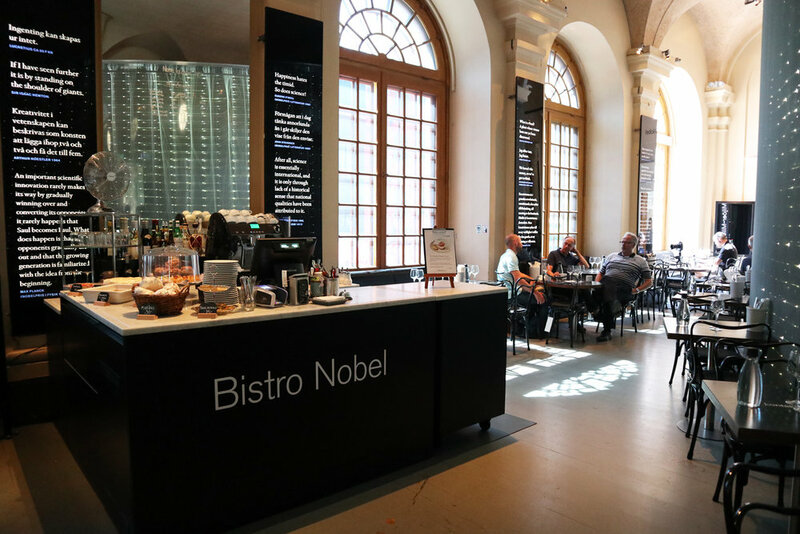 Nestled into its own little corner of the museum, Bistro Nobel allows visitors to sit and sip a beverage for hours. In the very back of the bistro, one can even relax into a sweet nook. And if you look under a bistro chair, you’ll see where Nobel Laureates have left their signature. A special seat at the table, indeed. In addition, it was such a delight to see the museum’s gift shop contain the most intellectually stimulating items I have ever seen in a gift shop. They are not to be missed. It also felt so incredible to see these postcards on the wall of the gift shop. They are a beautiful reminder of the collective brainpower we have throughout this world. Congratulations to all…on this lasting legacy. The Nobel Museum is a smaller museum, so it can become quite crowded by midday (great motivation to arrive earlier/in the morning). In a few years, the Nobel Museum will move to a new (larger) location, right next to the National Museum (where a very special painting resides). The Bistro Nobel had a few gluten-free treats for sale. However, this was one of the few eateries in Stockholm that didn’t sell veg food, so it’s wise to eat before arriving. The bathrooms (toalett) were private and clean. There’s also a large private family/handicapped toalett. The desire to return to the Nobel Museum is immense, especially to stroll through the gift shop…a perfect store for the intellect.